Whether you have a large family or frequent guests, you not only need but deserve to have the proper amount of space for everyone in your home. If your current house is lacking space but you do not have the budget to purchase a larger, site built home, consider purchasing a modular home from Modular Homes Austin! We offer a large variety of four and five bedroom floorplans that cannot only meet, but exceed your needs. Need lots of space? If you’re in search of a four bedroom home, we have options start at unbelievably low base prices. This 4 bedroom, 3 bath delivers spans a beautiful 2,600 square feet. The Master Suite is a luxurious oasis worthy of 5 stars. 4 Bed / 2 or 3 Bath – 2,100 sq. ft.
We are dedicated to providing your family the sweet life at affordable prices. The recessed entry makes a great first impression. The archway completes the effect. Like to Shop? The HUGE master closet is ready for your collection. We have a wide selection of floor plans in single-section or multi-section modular, mobile, and manufactured homes. Any extended family living together will love this plan with 2 bdrm/2 bath on each side. Perfect for mother-in-law or daughter-in-law suite. 4 Bed / 2 Bath – 1,980 sq. ft.
An impressive oversized kitchen features a Chicago style brick stovetop area and a massive island make this home a winner. Check out the bathroom vanity and dual closets. 3 Bed / 2 Bath – 1,860 sq. ft. The highlight of this home features a kitchen worthy of creating holiday memories. The massive kitchen island is complemented by an impressive appliance package and hidden pantry. 3 Bed / 2 Bath – 2,040 sq. ft. This has the open floor plan you’ve always wanted. Great for family get together, holdiays or anyday. The true chef inspired kitchen features 40+ cabinets is a delight. Depending on your budget and size requirements, we can help you purchase the best home for your needs and wishes. Our team has more than 60 years of modular home experience and can help you throughout the entire process, including the selecting, purchasing, and building. If you would like more information regarding our floorplans, Call Modular Homes Austin at (512) 385-9701 today! 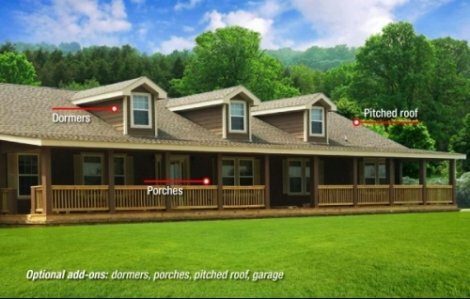 If you are searching for a two or three bedroom house, Modular Homes Austin offers two and three bedroom floorplans for our modular homes as well! Our team strictly works with the best modular home manufacturers so you may obtain the highest-quality home that can last a lifetime.